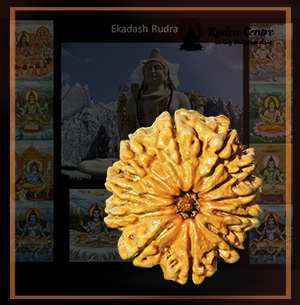 The Original 11 mukhi Rudraksha also known as the Ekadash Rudraksha is ruled by the 11 Rudras. This divine bead blesses the wearer with material abundance as well as spiritual growth. The eleven mukhi Rudraksha is a boon to mankind as it helps in awakening the Inner Guru. The gyarah Mukhi Rudraksha encourages and supports the wearer in meditating. It also awakens higher degree of awareness, makes one listen to his/her Inner Guru (conscious), enhances wisdom and gives virtue of right discernment. Moreover, this powerful Ekadash Rudraksha pacifies the malefic effects of all the nine planets. The 11 mukhi Rudraksha rules all the 9 planets. Vishuddha chakra or Throat Chakra is the fifth chakra that is associated with the 11 Mukhi Rudraksha. This chakra corresponds to the laryngeal plexus and is associated with both hearing and listening. It is the purification point of the body and is the center of wisdom, willpower, truth and power of choice. It is from this center of will that you express your needs and desires, your creativity, and your power of choice. It offers help in meditation and spiritual sadhana. It enhances concentration, memory and creativity. 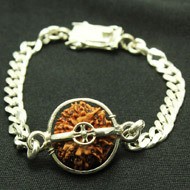 It blesses the wearer with wisdom and self-confidence. The 11 Mukhi Rudraksha blesses the wearer with ability to judge right, offers enhanced wisdom, gives control over all senses and blesses with a powerful vocabulary. Medical condition like asthama and other respiratory disorders are alleviated by the 11 Mukhi Rudraksha beads. It regulates the functioning of the thyroid gland and improves immunity. The Original gyarah mukhi Rudraksha must be energized before wearing. You can wear the Rare 11 mukhi beads on a Thursday. On a Thursday morning, wake up early, bathe and wear clean and fresh clothes. Sit facing the puja alter of your house in the East direction. With a focused mind chant the Mantra "AUM HREEM HOOM NAMAH" 108 times and wear the Rudraksha. The 11 Mukhi Rudraksha can be worn as a bracelet or a mala.You can get it strung in silk/wool thread or get it capped in silver or gold. 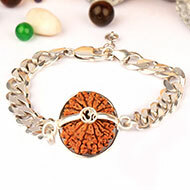 The Rudraksha bead must touch your skin so that it gets activated and starts working upon the particular areas. 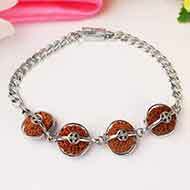 It is recommended to wear Rudraksha only as per RRST to get the right effects. Hold the Rudraksha bead in your hand and examine the bead, see whether the lines on the body of the 11 mukhi Rudraksha run smoothly without breaking from mouth to tail, that is from one end to the other without breaking. Check whether the bead is tempered or whether it has got holes. Test whether the bead is original by putting the Rudraksha bead inside a glass of warm water for some time and than removing it. Check whether the water is clean and does not have any germs. Examine whether the bead is still solid and does not have any glued surfaces. Look closely if the bead has any tiny holes or damage. If the bead is original allow it to dry and later wear it according to the process mentioned above. There are many 11 mukhi rudraksha dealers in the market. Shorlist the genuine ones. 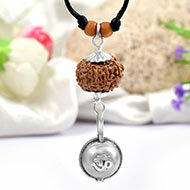 This splendid Rudraksha is associated with the Eleven Rudras. In the holy Rudra Samhita, it is mentioned that when the Gods were defeated by demons, the Gods fled from Amravathy, to get shelter from sage Kashyap at the hermitage. Sage Kashyap after learning about the defeat felt sympathetic and went to Benares (Kashi) to pray to Lord Shiva. The sage did a lot of penance to appease Lord Shiva. Finally, Lord Shiva appeared before him and promised the sage to offer help to the Gods. As a boon Sage Kashyap got eleven Rudras from Surabhi as his children. These eleven Rudras protected the Gods by defeating the demons. This mystic Rudraksha has the divine properties of Lord Shiva and Lord Hanuman. Hence the wearer of this pious Rudraksha bead is blessed with the wisdom to differentiate between the right and wrong. The eleven mukhi Rudraksha brings about a positive change in the wearers life. It blesses the wearer with fine oratorical skills, enhances intelligence and mental agility. It also makes the wearer listen to his Inner Guru. On a therapeutic level, the auspicious eleven mukhi Rudraksha removes fatigue and tiredness and enhances zeal and creativity of the wearer. The eleven mukhi Rudraksha has eleven mukhis (lines) which starts from the head of the Rudraksha and stretches up-to the bottom of the bead without breaking. The 11 mukhi Rudraksha bead represents the celestial energies of all the eleven Rudras. The pious eleven mukhi Rudraksha is very rare and the most magical gift Mother Nature has blessed us with. The 11 mukhi Rudraksha is found in Nepal as well as Java. 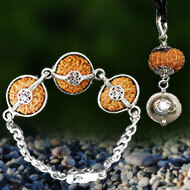 This wholesome and beneficial Rudraksha is oval in shape. The colour of the eleven mukhi Rudraksha varies from brown to dark brown colour shades. Moreover, the eleven mukhi Rudraksha pacifies the malefic of all the nine planets and helps in meditation and spiritual sadhana. Thursday is a good day to wear the eleven mukhi Rudraksha. Given below is the process to perform the Rudraksha Puja. Put a mix of water and Ganga jal in a vessel. Now place the eleven mukhi Rudraksha in this water and wash it gently with your hands. Do not scrub or use any other detergent or soap while washing it. Keep the eleven mukhi Rudraksha on the leaves. Take a fresh flower, mostly a marigold flower and sprinkle the mixture of plain water and gangajal on the Rudraksha bead. Apply sandalwood paste on the Rudraksha bead. Now light a ghee lamp and place it besides the copper vessel in which the Rudraksha bead is kept. Light dhoop sticks and offer its fumes to the eleven mukhi Rudraksha bead. With a clear conscience, concentrate and chant the Mantra "AUM HREEM HOOM NAMAH" "AUM SRI RUDRAYE NAMAHA" 108 times. 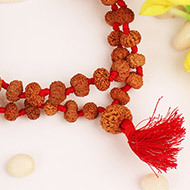 You can now wear the Rudraksha bead as this puja energizes it. Many people have benefitted from the powerful eleven mukhi Rudraksha. This Rudraksha bead gives a true meaning to life as it helps an individual to listen to his self-conscience, giving him the courage to take decisions wisely and to analyse every situation clearly without being biased, confused or influenced. The eleven mukhi Rudrakshas have uplifted many lives spiritually and have proven to be beneficial for pupils appearing for higher examinations. Apart from the above mentioned boons, the eleven mukhi Rudraksha also offers relief from respiratory disorders like bronchitis. The eleven mukhi Rudraksha can be worn by people who aspire to achieve success and stability in their lives and who are ambitious. 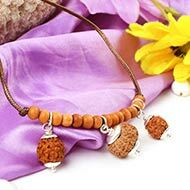 The price of any Rudraksha is based on 4 major factors namely a) Genuineness, b) Origin, c) Size and d) untempered bead. b)	Origin: The Nepal beads are highly priced as they show immediate effects. Whereas, the Java beads are little less priced as they show the same effect but take more time to show the results. c)	Size: The size of the Rudraksha beads varies from tiny, small, large, and collector size. The bigger the size of the bead the higher the cost. d)	Untempered or clean bead: If the bead is treated or if it is available in its natural raw state also determines the price of the bead. Myth: Original and supreme quality Rudraksha are not found. Fact: Original and superior quality Rudrakshas are available from Nepal and Indonesia. One needs to go to an authentic vendor.